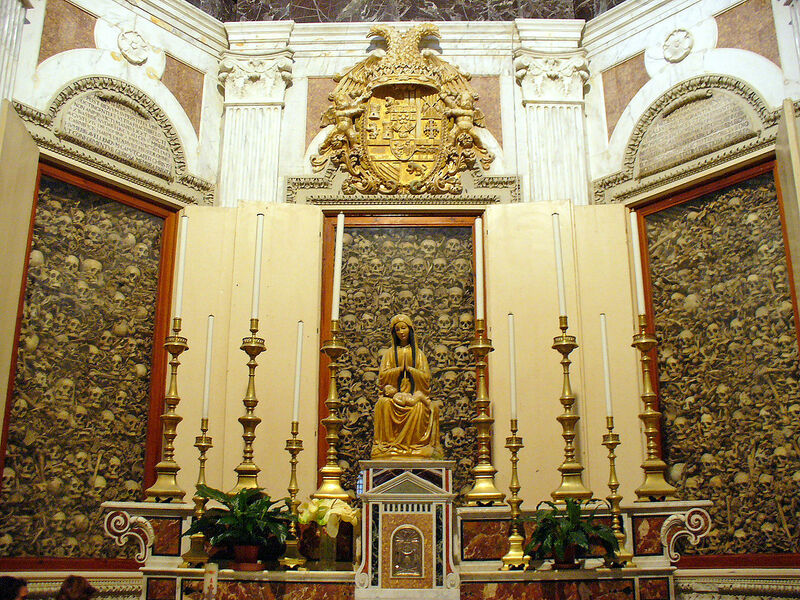 The skulls of the martyrs adorn the Otranto Cathedral walls. The Otranto Cathedral was consecrated in 1088. In August 1480, clergy and survivors of the Ottoman siege of Otranto took refuge in the cathedral – the Ottoman force eventually broke in and killed those inside, turning the church into a stable or a mosque and destroying its 13th century frescoes. After Otranto was retaken in 1481 by a force under Alfonso V of Aragon it was turned back into a church and heavily rebuilt to house the relics of the Martyrs of Otranto, who had been executed after the 1480 siege. Behind the chapel’s altar is the ‘stone of martyrdom’, traditionally held to be that used to behead the martyrs. On August 12, 1480, 800 citizens were taken to the hill of Minerva, now called the Hill of the Martyrs, and beheaded because they refused to renounce their Catholic faith. Their remains were taken to the cathedral and the skulls preserved in the altar piece as a prominent reminder of these 800 martyrs. Pope Francis canonized the 800 Christians who refused to denounce their faith and were slaughtered by Muslims in Otranto, Italy. 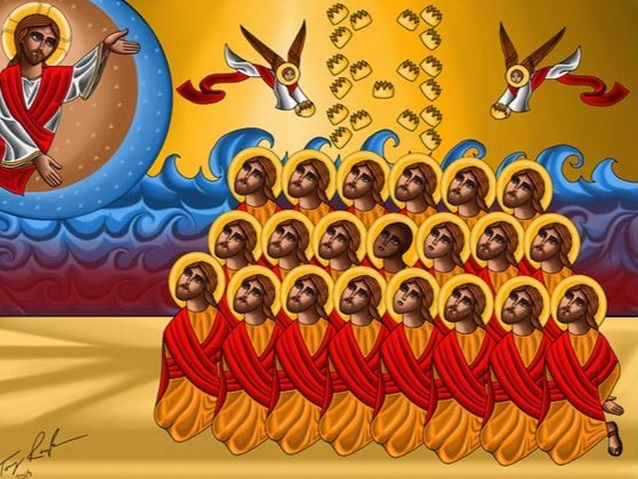 Earlier this month ISIS beheaded 21 Christian Copts on a beach in Libya. Virginia-area artist Tony Rezk, himself a Copt born in Egypt, paid tribute to the Egyptian martyrs with this beautiful icon.